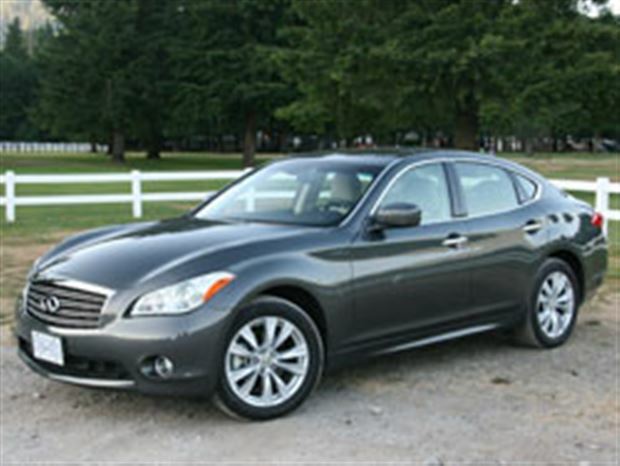 Infiniti, the luxury division of Nissan, pulled the wraps off the 2011 edition of its flagship M series sedan earlier this year. It comes in both rear-drive and all-wheel drive versions and has been completely redesigned inside and out, with very attractive long and slinky exterior styling lines. The M was designed around an idea called “organic body glove,” according to Ian Forsyth, director of product and corporate planning at Nissan Canada. “We wanted to build a vehicle that’s adaptive to the environment, different road types, different styles of driving and fits so well that it becomes an extension of the driver,” he said. Since Infiniti abandoned its Q series, the M has become the flagship sedan of the luxury division. Under the hood, there’s now a choice of V6 and V8 engines; both have small increases in displacement and substantial increases in power. Yet, because of new technology advances, the new M consumes even less fuel, despite the power improvement. Infiniti Drive is a new feature that allows the driver to choose between Normal, Sport, Eco and Snow driving modes, via a rotary dial on the centre console. Each mode adjusts throttle sensitivity and transmission mapping, to help optimize performance and/or fuel economy. Green and yellow lights on the instrument panel provide additional feedback on driving efficiency while in the Eco mode. The system also provides physical feedback through the gas pedal, giving a slight pushback when driven inefficiently. A new start price of $52,400, for the rear-drive M37 with a 3.7-litre V6, is $3,100 less than the 2010 model. The new rear-drive M56, with a 5.6-litre V8, sells for $66,200, which is $3,350 less than the 2010 version of the V8 powered M. All-wheel drive adds $2,500 to the cost of an M, which then becomes the M37x or M56x. There are optional Premium ($3,800), Touring (Premium plus $5,100 — AWD only) and Sport (Premium plus $7,200 — RWD only) packages; a fully loaded M56x tops out at $73,800. The increased power and torque offered by both engines comes from the use of continuously variable valve timing technology on both the intake and the exhaust valve systems. New variable valve event and lift (VVEL) technology has also been applied to the intake valves on both the V6 and V8 engines. In addition, the V8 engine now comes with direct fuel injection. The changes push V6 power up nine per cent to 330 horsepower, while V8 power is up almost 30 per cent to 420 horsepower and torque is increased 24 per cent to 417 lb-ft. Surprisingly, fuel consumption is lower by 1.7 L/100 km on the highway (M56x) and 0.8 L/100 km on the highway (M37x). Both engines are mated to a new seven-speed automatic transmission; it has manual mode operation and steering wheel paddle shifters are available. New standard features, in addition to Infiniti Drive, are power-folding side-view mirrors, front door handle courtesy lights, active noise control and a rear-view monitor, plus enhancements to the Intelligent Key memory (which now includes audio, navigation and climate control settings). The new M is a launch pad for an interesting collection of new technologies. There’s an active warning system called Blind Spot Intervention; in addition to alerting a driver to a vehicle in its blind-spot zone, selective brake intervention is used to help safely direct the M back into its lane of travel. A “Forest Air” system reduces unpleasant odours entering the cabin and provides a breeze-like airflow. Sensors automatically open and close air intake ports to reduce the intrusion of dust, other vehicle exhaust or unpleasant odours into the cabin. It uses filters and an air purifier to help remove allergens, mould and viruses in the air and it includes humidity control feature. A special Sport Package is offered on the rear-wheel drive models, and the Touring Package includes a Bose Studio Surround sound system with digital 5.1-channel decoding and 16 speakers.